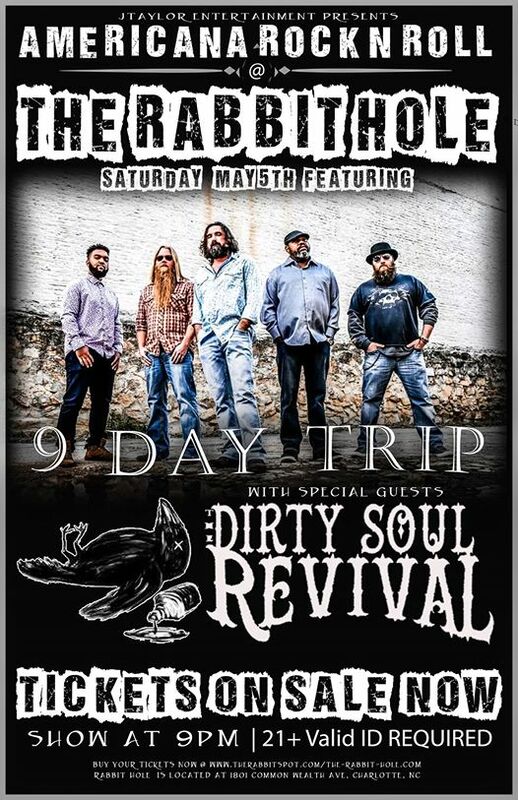 9daytrip and The Dirty Soul Revival - The Jackalopes Co.
Join us at the Rabbit Hole for an amazing Cinco De Mayo Show featuring 9 Day Trip and Dirty Soul Revival!! 9DAYTRIP is an Americana Blues Rock Jam Band from Salisbury NC. In 2013 the group formed together to just jam and perform for friends and family. In late 2015 they performed their first public show with such a great crowed response that they decided to continue live performances which has taken them to over 50 locations and across 4 states so far. In 2016 they recorded an EP, with Rob Tavaglione at Catalyst Recording, titled “Two Sides To Every Tale”. They were nominated for Best Americana Group by the Carolina Music Awards that same year for their EP. In 2017 They released a new single titled “9 Day Trip” and again nominated for Best Americana Group and this time won the award! In 2018 the band released their first LP, again recorded with Rob Tavaglione, titled “Into The Great Unknown”. Although they enjoy the studio, 9DAYTRIP live performances consist of high energy visual and audible experiences that are unlike any other. Their original story line songs are written based on true life events and have a way of relating directly to the listener. The Dirty Soul Revival’s unique reinterpretation of classic hard-hitting rock and roll formulae recalls elements of the past with an ever-present boundless energy, fit to cement their place in the future. Abraham, Brandon, Jason, and Jerard have been nothing short of a best-kept-secret among Asheville concertgoers since the band’s formation in 2015, building a fervent and dynamic fan base leveraged by their ever-substantiated reputation for consistently well-rehearsed and impassioned, explosive live performances. The band’s celebrated sound and spirit draws significant influence from the driving force of Southern rock pioneers Lynyrd Skynyrd, the billowing and bouncing funk soul of the Black Crows, to the layered harmonies and memorable hooks of The Beatles and Led Zeppelin, to the contemporary psychedelia of Jack White among many more. Having recently finished their new full length record, ‘Brave New World’, produced by Richard Young of The Kentucky Headhunters and Black Stone Cherry, DSR is currently touring the South East regions of NC,FL, GA,TX, LA,TN, WV, VA with their own entertainment company, JTaylor Entertainment.